The team at Velo has been successfully using Repeat Signage Media Wall since 2011. 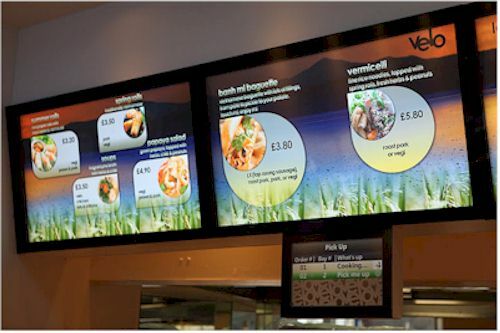 Velo's digital menu board comprises four Panasonic Full HD display screens installed in horizontal format, and Repeat Signage Media Wall digital signage software. The concept at Velo Restaurant is simple. Customers use the display screens above the counter to see the menus. Orders can then be placed and paid for at the self-service touch screens, which are sited along the rear wall. The order is then collected at the pick-up counter. The team at Velo Restaurant has used Repeat Signage Media Wall for over 7 years, since 2011,to display their menus and timely seasonal offers to their customers. When the Repeat Software team launched Repeat Signage V4 Media Wall edition, Velo's upgraded to take advantage of the new exciting features, including the ability to display QR codes, a built-in spreadsheet grid, which allows spreadsheets to be displayed, page-turning PDFs and display of database content.